Does Environment Contribute to Food Choices? Posted on June 7, 2016 | Comments Off on Does Environment Contribute to Food Choices? Do you ever wonder which is the more difficult path–breaking unhealthy lifestyle habits or committing to a healthier diet? 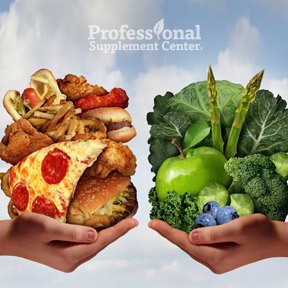 Neither is easy, but either choice will make you feel and look better and will contribute to your long term health. Unhealthy habits, like regularly skipping meals or mindlessly snacking in front of the TV, become so ingrained they become second nature. Cleaning up your diet requires changing not only your eating habits but your environment as well. The key is to switch things up and create good dietary habits that then become automatic themselves, such as reaching for a piece of fruit instead of a bag of chips. As eating is stimulated by cues in our environment, taking the time to change that environment can have a huge impact on mindless eating and your overall food choices. Clean up your kitchen. Part of creating new healthier eating habits is creating a different environment in your kitchen. One study showed that a cluttered, chaotic kitchen can negatively influence your eating behavior. A stressful environment, such as a messy kitchen, can make one feel particularly out of control and result in poor food choices and overeating. Clearing the counter and putting out a bowl of fruit leads to a 70% increase in fruit consumption. Keep tempting foods stashed away or don’t keep them in the house at all. It’s very hard to resist temptation when tempting foods are in your line of vision. Cues in our environment can influence how much we choose to eat. Serving food family style results in having seconds 30% of the time. Serve the food in the kitchen before you sit down or set the table with empty plates and place the food at least 6 feet away. Unless you are really hungry, you will be much less likely to have additional food when you have to get up for more. You’ve heard it before but using smaller plates and tall, thin glasses actually does help you to eat and drink less. Filling a smaller plate or taller glass is as visually satisfying psychologically as full dinner plate. When you don’t have to think about portion control, you are naturally stimulated by your environment to eat a normal amount. To fully enjoy your food, put your devices away during meals. Texting, playing games, or scanning social networking sites takes your attention away from eating, which makes it hard to realize how satiated you actually are. Distracted eating often results in consuming 20-60% more calories and detracts from one of the great joys of life. When dining out, don’t follow the crowd, especially when it’s food you would not typically choose. Although research shows that dining partners influence our food choices, you don’t have to order what your friends order. If you are the first to order and choose a salad, chances are good others will follow suit. Get a handle on portion sizes. Though lacking in nutrients, typical sweet and salty snack foods are tasty and addictive, which makes it very easy to overindulge. The revised nutrition labels coming in the next year or two should increase our awareness of serving sizes. In the meantime, break the habit of eating snack foods straight out of a bag or package, which only encourages overeating and runaway portions. To make you more conscious of how many servings you are actually consuming, take one serving and go back for another if find you really want more. Plan your meals. Spend some time on the weekend to plan your meals for the week. Keep your kitchen well stocked with items, such as chicken breasts, beans, frozen veggies, whole grains, greens, and eggs, that you can quickly and easily turn into healthy meals. Investing time on the weekend to make one pot meals, that you can then portion out and freeze, ensures a healthy meal when you may be time constrained on weeknights. If you are eating well all week but splurging on weekends, you are sabotaging a week of good effort. Think of other ways to reward yourself that don’t involve eating and limit yourself to one special treat on the weekend. Close the kitchen after dinner. To avoid nighttime noshing, try thinking of the kitchen as being closed until morning. Some find that brushing their teeth after dinner before settling in to read or watch TV helps to remind them that they have finished eating for the day. Set mini-goals. Start with small steps that add up to a change of habit. If you habitually skip breakfast, try preparing something the night before that you can grab on your way out of the door in the morning. This can prevent you from settling for the doughnut in the lunch room when hunger pangs set in, and may prevent overindulging throughout the day. If you goal is to eat more vegetables, try adding some to pizza, sandwiches or salads or choose a new vegetable each week when you do your grocery shopping. Remember, healthy eating is not about depriving yourself of all the foods you love. It’s about changing your environment and creating sustainable eating habits that you can easily do to stay healthy, reduce your risk of developing chronic disease and increase your longevity. While some are making a concerted effort to support or regain their good health, researchers who analyzed data from a 2013 Behavioral Risk Factor study found only 6.3% of the 395,343 study participants engaged in all five recommended behaviors for chronic disease prevention and increased longevity. These include maintaining a normal body weight, not smoking, participating in regular physical activity, sleeping 7 to 8 hours nightly and a zero to moderate amount of alcohol consumption. This entry was posted in Home and tagged Does Environment Contribute to Food Choices?, Professional Supplement Center, Vitamins and supplements, weight loss, www.professionalsupplementcenter.com. Bookmark the permalink.